NEW YORK -- Giancarlo Stanton got his 31st home run in just under the wire Friday night. 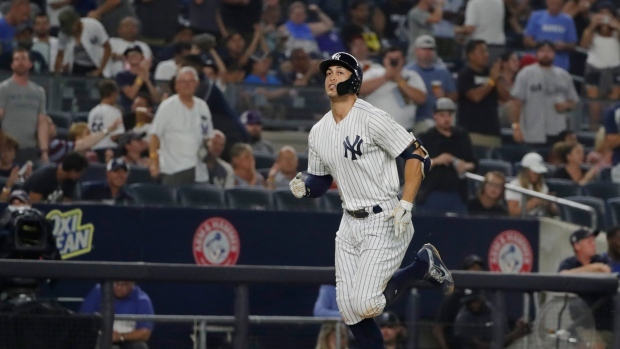 Neil Walker hit a three-run homer, Stanton added a blast over the home bullpen at Yankee Stadium and New York rallied for a rain-shortened 7-5 victory over the Toronto Blue Jays on Friday night. Stanton drove a ball into a party deck in right-centre during the bottom of the seventh, and a batter later, umpires pulled the teams off the field amid rain at Yankee Stadium. The game was called with one out in the seventh after a delay of 1 hour, 25 minutes, capping a come-from-behind win for New York after totalling six runs over a three-game series against Tampa Bay this week. "The win is really huge for us," Stanton said. Rookie Gleyber Torres drove in the go-ahead run with a fielder's choice off Joe Biagini (1-7) in the fifth. Despite dealing with a 2-hour, 14-minute rain delay before a game at Kansas City on Thursday night, the Blue Jays came out firing Friday, jumping on starter Lance Lynn for four runs. Kendrys Morales and Kevin Pillar each had RBI singles before Randal Grichuk walked to load the bases with two outs and Aledmys Diaz followed with a two-run single. The Yankees cut the lead in half in the bottom of the inning against starter Marcus Stroman. Aaron Hicks worked a two-out walk and scored from first when sure-handed centre fielder Pillar misplayed Didi Gregorius' triple in the gap. Miguel Andujar added an RBI double. New York, which went 1 for 20 with runners in scoring position in their last two games against Tampa, went 2 for 5 in the opener of the three-game set against Toronto. "It's huge especially against a good pitcher that came in throwing the ball well," Yankees manager Aaron Boone said. "I just thought the at-bats were really strong up and down, and a lot of guys having a hand in it." Torres doubled and Greg Bird worked a 10-pitch walk off Stroman in the fourth before Walker delivered his shot. It was Walker's seventh homer of the season and put New York ahead 5-4. Stroman, who struggled with a blister, gave up five runs and six hits in four innings. A graduate of Patchogue-Medford High School on Long Island, Stroman is winless in seven starts in the Bronx. "There's no doubt, I know it's his finger and I know it irritates him when he's hitting those seams," Blue Jays manager John Gibbons said. "He's battled through it before but you know it's a tough lineup to face though, you're staring at that short right field wall. Tried to get a ball in on Walker there and it leaked back out over the plate a little bit and that was the difference." The Blue Jays chased Lynn in the fifth when Curtis Granderson doubled and scored on Devon Travis' single. Lynn was charged with five runs and six hits in four innings. He struck out five but walked three. Blue Jays general manager Ross Atkins said Gibbons will lead the team through the remainder of the season before his future is addressed. Gibbons said last week he probably would not want to manage the club through a full rebuild. Atkins thought the rumours regarding Gibbons' future with the club were becoming a distraction. "This game's about the players, it's about fans. It's not about Gibby, it's not about me. It will never be," Atkins said. An aging roster, injuries and lack of production has Toronto in fourth place in the AL East, 31 1/2 games behind first-place Boston. Gibbons' contract runs through the end of the 2019 season with a club option for 2020. He's in his second stint as Blue Jays manager after returning to team in 2013, and led Toronto to the 2015 and 2016 AL Championship Series. Blue Jays: C Luke Maile was placed on the paternity list before Friday's game. OF Billy McKinney replaced Maile on the roster. Yankees: Boone said there was some improvement with C Gary Sanchez (groin) and OF Aaron Judge (fractured right wrist). Sanchez increased his running Friday afternoon. ... Judge played catch but felt some soreness in his wrist and didn't follow through with dry swings. Blue Jays: RHP Sean Reid-Foley (0-1, 5.40 ERA) will be making his second major league start Saturday. Reid-Foley didn't fare to well Monday at Kansas City, allowing three runs and six hits over five innings. He walked three. Yankees: RHP Luis Severino (15-6, 3.27) is coming off a tough start in have up four runs in four innings for the loss against the New York Mets on Monday. He's 3-0 with a 2.19 ERA in his last 4 starts against Toronto.